The process of posting bail can be confusing and stressful. Jim Frank Bail Bonds has built a reputation by offering honest, reliable answers to clients in need of bail bonds services. We are available to answer your questions and help you through the process of posting bail and getting your loved ones released. We have over 30 years of experience, and are known for being professional, confidential, and discreet. We have worked with clients in Hagerstown, Frederick, Westminster, Chambersburg, Columbia, Baltimore, and all over Maryland with appeal, traffic and transfer bond services. We also serve clients in Pennsylvania and nationwide. When someone is arrested and placed in custody, the police, a commissioner, or a prosecutor must decide what charges will be placed against the arrested individual. When the charges are decided, the person under arrest will have an arraignment. During the arraignment, the charges will be read against the arrested individual, and a judicial officer will set terms of their release, which may be a bond amount. Depending on the severity of the crime and prior convictions, the authorities may set bail as a way to ensure that the defendant will show up in court for their trial and any other related hearings. If a defendant is not able to pay the entire bail amount on their own, this is when the services of a bail bondsman may be helpful. A bail bondsman will guarantee the entire bail amount to the court. 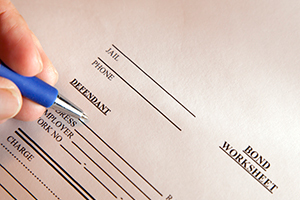 A cosigner or guarantor is required, regardless of the crime or amount of the bail. The bail bond company charges 10% of the total bail as a premium, as required by law. When the defendant completes their legal requirements, the bond is returned by the court and the bail bond company keeps only the 10% premium. If, however, the defendant does not meet their legal requirement and flees, the cosigner or guarantor must pay the bail bond company the full value of the bond, plus any recovery expenses. Once it’s determined that your friend or family member can post bond and a bail bond is posted, they will be released. When the release is granted, the correctional facility will process the person out of jail. Then, the arrested person will report to the office of the bondsmen to complete paperwork. Criminal history and court history. Personal history and ties to the community. If you need to post bail for a friend or family member or want more information, contact Jim Frank Bail Bonds today at 301-416-8148 for Maryland and 717-977-3215 for Pennsylvania.